'ExtFS for Windows' Corrupts Ext4 File Systems Under Windows 8! ‘ExtFS for Windows’ is a free program from ‘PARAGON’ software group that enables Windows users to access their Ext 2/3/4 file systems directly from ‘My Computer’. I have had used this program in its early days not ever since, but recently I came across it quite accidentally and decided to give it a go under Windows 8. But before I begin, let me give you a brief introduction to this utility because I think it is important. This tool uses another utility called ‘Dokan’ (a separately developed utility, now abandoned). To spare you with the boring technical details, ‘Dokan’ acts as the middle man between Windows’ Kernel and the Paragon’s utility that actually deals with the ‘Ext’ file systems. 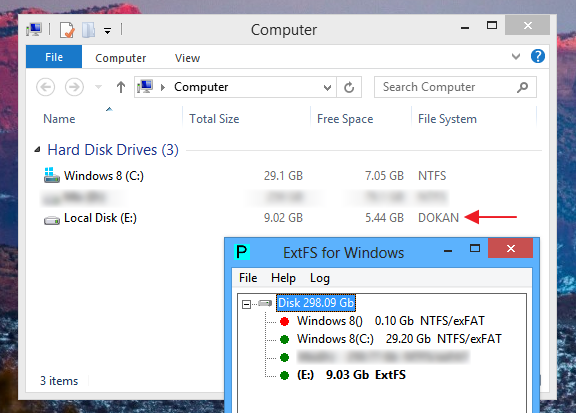 In other words, when you access a ‘Ext’ file system under Windows using ‘ExtFS …’, Windows passes your request to ‘Dokan’, and then ‘Dokan’ passes that to the Paragon ‘Ext’ mounter. When the ‘Ext’ mounter done doing its job (say a file read), then it passes that data to ‘Dokan’ and ‘Dokan’ then passes it to Windows. In other words, neither the Paragon’s ‘Ext’ mounter nor Windows operating system are aware of each others existence, which is also why, the mounted ‘Ext’ file systems are displayed as ‘Dokan’ in Windows file explorer, not as ‘Ext 2/3 or 4’. Now let me come back to the story. I used Ubuntu 13.10 and ‘KaOS 2014‘ (both residing on ‘Ext4’) for testing this tool (version 2.73, Windows 8 64-bit), on two different occasions, and the results were pretty much identical. First I tried reading a web page, a ‘Zip’ file and a video file. The web page and the ‘Zip’ files were read without any issues, but the video playback was interesting. First I tried playing it through ‘PotPlayer’ and it continuously skipped frames while playing. 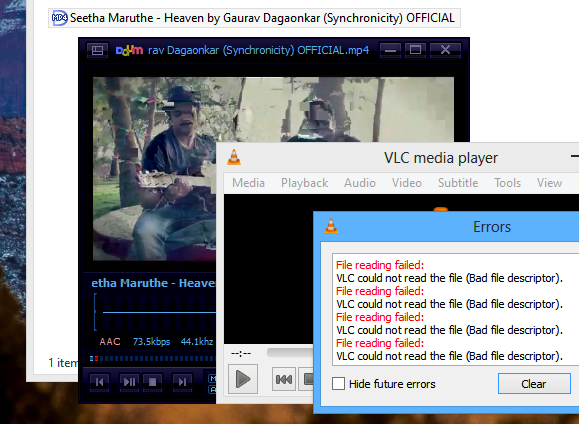 Then I tried it under VLC and it just gave this big fat error and exit. 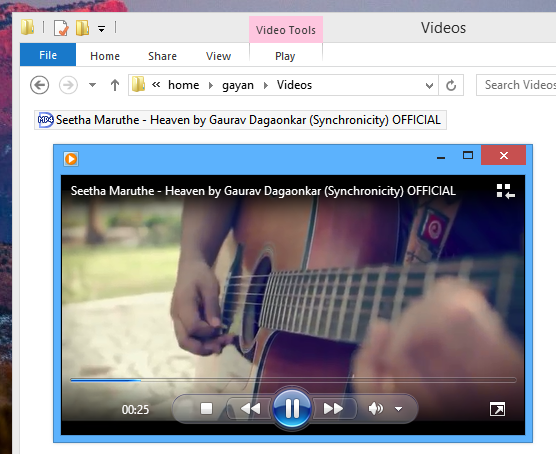 Windows Media Player however, played the file perfectly well!. How is this possible ? I do not know the exact reason, but my guess is, it is because of ‘Dokan’. Although not always necessarily true, if it was the Ext mounter’s fault, then all the media players should have failed because there was very little ‘Dokan’ could do, if Paragon’s Ext mounter provided it with corrupted data reads. But no, the playback was perfect under one player while two others failed. So why did not the web page and zip file readings fail ? Playing a video (or any multimedia file for that matter) is a bit different than opening a web page or a zip file, because a video player does not request the whole file to be loaded when playing, it only requests its content on demand. This increases the communication instances between ‘Dokan’ and the Ext mounter (in this case), and since ‘Dokan’ does not officially support Windows 8, it could simply be the result of a ‘bad communication’ (again, this is just a guess). I also tried copying few files into the ‘Home’ folder, although after they were copied I could see and access them in Windows 8 (sometimes only), when I tried rebooting to see if I can read them in Ubuntu (and ‘KaOS’), on more than one occasion, I got the ‘file system corrupted …’ error (shown below is one that I received in Ubuntu). I was able to fix the issue by running ‘fsck’ (command-line based GNU/Linux file system checker) manually, but that took away the file. 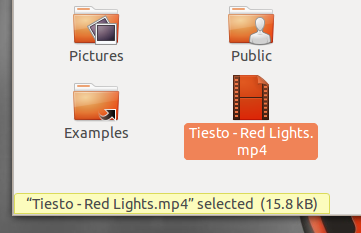 On another occasion, after copying a video (about 74.4MB) file I booted into Ubuntu and although I did not receive any ‘file system …’ errors, ‘Nautilus’ showed its size as ‘15.8KB’ and it was not readable. So who’s fault is it, this time ? I do not know because I am not an expert on file systems, but this time it could have been Paragon ‘Ext’ mounter’s fault. But the point is, if you are planing on using this utility under Windows 8, I would advice against it, and there is no option to use it with read-only permissions either. That said, I do not know whether it works on other versions of Windows, though from the look of things, it should be dangerous to use under Windows 8.1 as well. Paragon ExtFS for Windows Home page. ‘Dokan’ (file system driver) Home page. I can confirm. I have been using Paragon NTFS for a couple of days, and I had to do multiple file system repairs. As far as I see, no data has been lost, but still this is unaccetable. Uninstalled, back to ext2fsd. I had a Truecrypt file on an ext4 partition and Paragon ExtFS has broken the file. Thanks God I had a copy on another disk, otherwise I’d have lost a lot of data. My advise: DO NOT USE PARAGON ExtFS. Broke mine ext4 too. Lost 400GBs of re-downloadable content. It is annoying anyway. Thank you for the update Jantan, and I’m really sorry about losing 400GB of data, I know how it feels. Anyone can share a better solution to writing in EXT partitions from windows? Also, I can no longer access an etx4 partition I use to store data. I will try to repair it using fsck. You’re welcome Jinal, and good luck. I also have used Paragon ExtFS under Win 8.1. Usually, I only read the ext4 partitions of Linus, but recently I tried to synchronize some data. One ext4 partition became unusable, with about half the capacity and no files shown after fsck. Another ext4 partiotion was repaired by fsck, but some files were missing. I also wrote something to Ubuntu’s home folder under Windows, causing Ubuntu to start very slow, finally losing some gigabytes of capacity. Is there any way to recover the lost capacity (fsck does not do that), or do I have to format and restore? Paragon’s solution is definitely making trouble. Is ext2fsd better under Windows 8.1? I know, it can be restricted to read only, but how about write ext4? Or, is there any better solution? I’ve used ‘ext2fsd’ in the past, but only to read data on Ext4 file systems, not to write anything. So I cannot give an opinion on that. Secondly, I’m no expert on recovering data from Ext4 file systems. However, there is a tool called ‘extundelete’ that can be run on an Ext4 partition. While its functions are somewhat limited, some seem to have been quite successful using it to recover deleted data. However, in this instance, since we are talking about a corrupted file system, I’m not sure if it’ll be able to perform its duty. So first run ‘fsck’ and then try using ‘extundelete’. I’ve added two links using which you can get a reasonable understanding of ‘extundelet’. Good luck. After fsck and restoring some files from lost&found, some others from backup, I changed to ext2fsd, without write access. That lets me access the Linux data in Windows (XP and 8), but leaves them intact (read-only). For frequent data exchange an NTFS file system is better, even when NTFS needs defragmentation from time to time. Linux access to NTFS (ntfs-3g) is working without problems. Paragon extFS was not so nice an experience for me. Glad to hear that Hako. I had heard there were drivers for windows to allow ext4 filesystem access in Windows. I searched for it, and found paragon extfs. Their really nice looking website and testimonials made me suspicious (usually technical projects like this just have a github page, and focus on a working project). Found this post while searching for user opinions on keywords “Paragon extfs”. Glad to have avoided it entirely, and installed ext2fsd as suggested in the comments. For those that lost data, if it happens to still be relevant, I would recommend using Parted Magic at https://partedmagic.com/ which is a bootable Linux disc for recovery and numerous other computer things. They do charge for it these days, but it’s only something like $10 and you can burn the ISO to CD/DVD or USB using Unetbootin (good instructions on the site). It has everything there for recovery and from my experience, if there is any hope of recovery ‘TestDisk’ is the best hope. It’s in the rescue / recovery area (can’t recall exact name, but just look in the start menu). It can work with ext2, ext3, ext4, fat16, fat32, ntfs, and reiserfs and it’s worked fine on everything I’ve used it for. Whilst it is Linux, it’s not for full-time OS use, just for recovery. It’s also a great tool just for general partitioning work and numerous other everyday geeky computer things. Thanks Gayan for the advice, I was going to get the Paragon tool, so glad I didn’t! Maybe it’s worth dropping them an email with this link, maybe they might actually do something about it – if there’s this much response here, I wonder what their tech support emails must look like! You’re welcome. And thank you for the software suggestion. ‘partedmagic’ looks really good actually. Paragon may have a new version (at the link given following the article), with up to Windows 10 compatibility. The free version now makes no mention of read/write capability — only read, and file copying — however, r/w is seen in the ‘Professional’ version’s description. Just confirming had similar issues under Windows 10. Just to confirm, I too lost a Linux installation using extFS for Windows on WIndows 10. With that said, I was able to read and move data from the ext partitions and so I guess this means it could be useful to some extent. Though be warned, that once this utility touches your partitions, it’s most likely that it will corrupt them in the process.